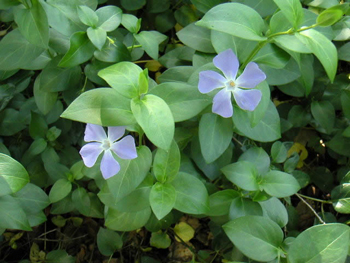 Periwinkle is a prostrate, evergreen, creeping plant; the stem bears opposite, dark green, shiny leaves at the joints. During March and April a pale blue flower grows from each stem joint on a long, hollow stalk. Grows wild in Great Britain and Europe and is also cultivated there and in the United States. The pale blue or white flowered plants grow in woods and orchards, hedges, but the purple ones only grow in gardens. Culpeper tells that the legend has it that if the leaves are eaten by a man and a woman together, it will cause love between them and they will stay in love all their lives. Both V. major and V. minor make good ground cover, very hardy, thrives in shade. One of the best plants to grow beneath trees and other areas where a carpeting effect is desired. The herb is propagated by root divisions and cuttings. 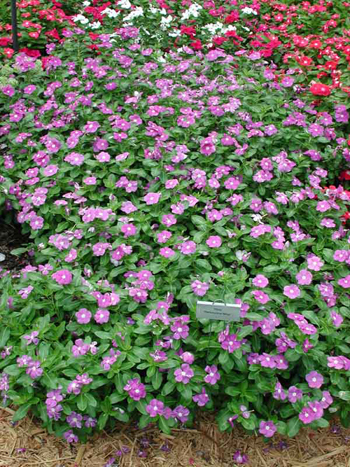 From several plants of the Vinca family is obtained the drug vinblastine sulfate, now being tested in America for the treatment of Hodgkins’ disease. Periwinkle is a remedy for diarrhea, flatulence, indigestion, ulcers in the throat and mouth, diabetes, disorders of the skin and scalp, excessive menstruation and hemorrhage. Chew the herb to help stop bleeding in the mouth, nose, and to help toothache. The tea is used for nervous conditions, hysteria, and convulsions. Improves blood flow in cerebral arteriosclerosis and can be helpful after a stroke; tonic for the cerebral arterioles, reduces high blood pressure, a blood tonic.